Does anyone not love brunch? Who has not rolled out of bed around 11am on a Sunday morning craving the perfect waffle or stack of pancakes? If you are traveling through Illinois and looking for the best spot to load up on a plate of delicious carbs or the perfect Bloody Mary, consider one of these spots. This quaint café is a family-owned business that believes in serving great food with the highest-quality ingredients. The menu is decently priced and includes vegetarian and gluten-free options for their guests. There is a beautiful covered patio that offers the perfect spot for dining outdoors. The restaurant is located in the Trolley Barn in the town’s downtown historic district. Whether you are shopping for antiques or biking the nearby Old Plank Bike Trail, the White Street Café is a perfect stop to rest, recuperate and recharge before heading out to enjoy the rest of your day. This charming breakfast spot first opened in downtown St. Charles in 2015. The owners wanted to open a restaurant where locals and guests could come to experience premium dishes at reasonable prices. The interior of the main dining area is covered in historic photographs of St. Charles. The artwork was loaned to the owners by the St. Charles History Museum. The menu is priced affordably and includes dishes like Hawaiian Pineapple Eggs Benedict and Waffles Biscuits and Gravy. If you are the diner who likes a glass of wine or a cocktail with your breakfast, you are in luck as the restaurant offers a wide variety of cocktails, including Abby’s Signature Bloody Mary. 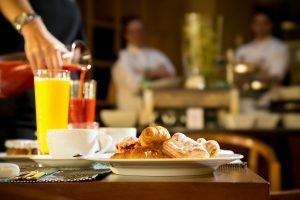 When the word “brunch” is included in the name of the restaurant, you can be sure that you are going to have some great items on the brunch menu. While perusing your options here you will find traditional standbys on their menu including French toast and stacks of pancakes. However, it is the traditional dishes with a twist for which the chain is known. Diners can enjoy everything from stuffed French toast covered in fruit compote, to blueberry bliss pancakes and avocado-topped breakfast quesadillas.